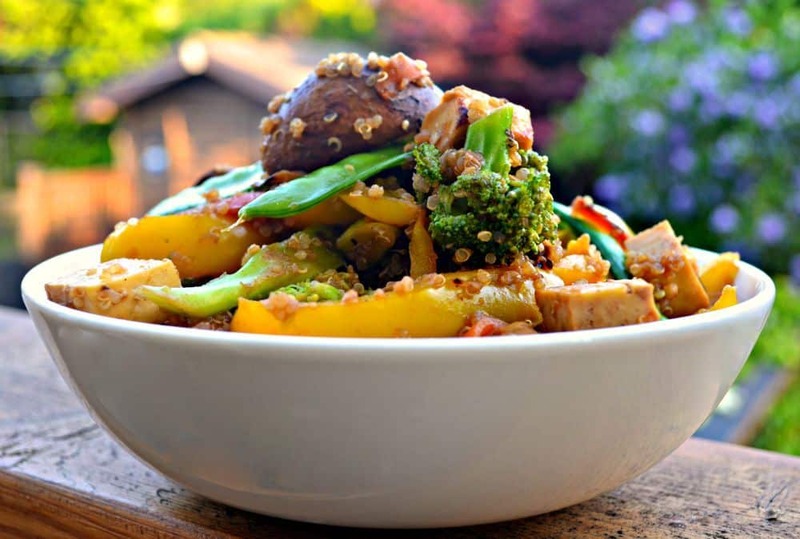 This Tofu Quinoa Stir Fry is quick, easy and very healthy. It is also packed full of protein and can be ready in under 20 minutes! When I am pushed for time I like to prepare a stir fry for dinner. Stir fries are the ultimate healthy fast food. They are so quick, easy and healthy. They also involve minimal dishes/pots and pans so there isn’t much washing up to do after. I might love to cook but I do not love the clearing up that comes with it! I usually serve stir fry with either rice or noodles, like my Swiss Chard Soba Noodle Stir Fry, but I had some cooked quinoa sitting around in the fridge just asking to be put to good use and so it ended up in this Tofu & Quinoa Stir Fry. I actually didn’t think this recipe would be blogworthy but when we sat down to dinner I discovered that it really was. Of course it was past saving for photos by then so I had to make it again a few days later and capture it before it got inhaled all over again! This Tofu & Quinoa Stir Fry comes together from start to finish in under 20 minutes and half of that I have allowed for chopping. The actually cooking is around 10 minutes only. Perfect for an easy week night dinner. Quinoa’s superfood status is certainly deserved. It is a complete protein, it is gluten free, it has a low glycemic index and is high in anti-inflammatory phyto nutrients. All in all it is pretty good for you. I know so some people do not like the look of it and I have even heard it called ‘creepy looking’. Personally I love quinoa as an ingredient and think those little curls are super cute! 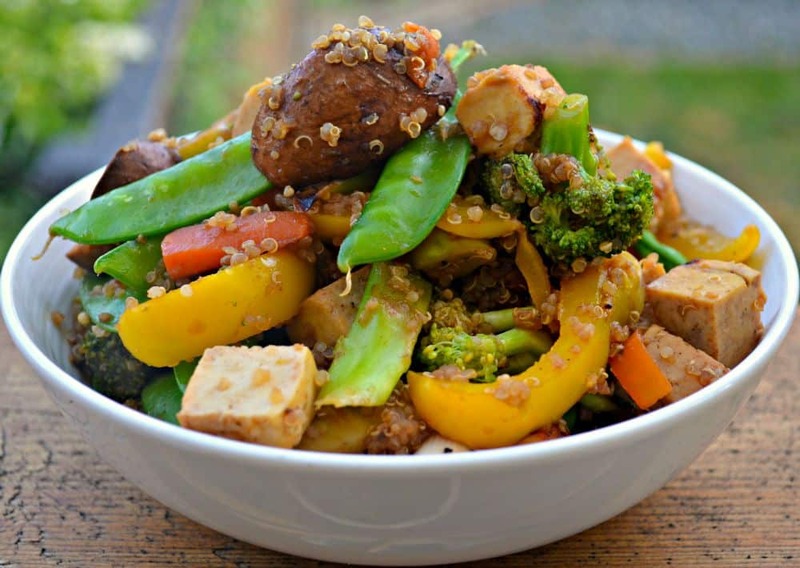 This Tofu & Quinoa Stir Fry uses cooked and cooled quinoa. If you are unsure how to cook your quinoa correctly then there is a great video and instructions here. As always I love to hear your feedback. Please leave comments in the comments section below and share your photos of my recipes on Instagram @avirtualvegan and add the hashtag #avirtualvegan so I don’t miss them! If you want to try another great quinoa dish then check out my Lemon, Spinach & Cranberry Salad. 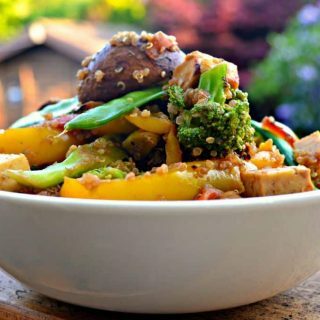 Quick, easy and healthy Tofu Quinoa Stir Fry. Ready in under 20 minutes! Add the oil to a pan and fry the tofu (turning frequently) until starting to get crispy. Add carrot, broccoli and peppers to the pan and sauté over a medium heat for a few minutes until just starting to soften. Add the garlic and sauté for a minute or two longer. Add the mushrooms and ¾ of the green onions. Cook for another couple of minutes. While cooking mix the tamari/soy sauce with the maple syrup and Chinese 5 spice in a small bowl. Add the quinoa and snow peas to the pan along with the Tamari/ soy sauce mixture and the tofu. Stir together well and cook until the quinoa is heated through. Serve sprinkled with the remaining raw green onions.